← Should some people ever be allowed to drive again? I must stress that I am supportive of the London Cycling Campaign’s approach, but there are some criticisms that can be made. One of the most important, I think is the omission from their design of the ‘free’ left turn you would get with tracks which continue, protected, around the apex of the junctions, as in Paul’s design. These allow left turns by bicycles at all times, regardless of the light sequence. LCC’s tracks, on the other hand, stop at the junction. 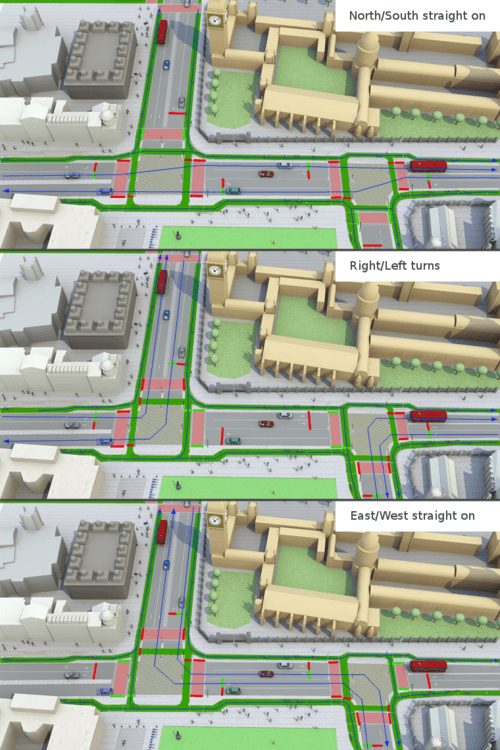 Right turns, under Paul’s ‘Dutch’ scheme, are achieved by queuing in dedicated waiting areas, then moving with a light sequence synchronised with right-turning vehicles in the carriageway, as shown in his graphic, below – in the last box, for instance, cyclists turning right, towards the Big Ben clock tower, move with right-turning vehicles, while vehicles heading straight into Whitehall on are held at a red light. This means that all the turning movements of bicycles are entirely protected and separated from motor vehicles. No need for trixi mirrors, keeping out of blind spots, attempting to get into ASLs, and so on. It does, of course, add a little to the time it may take to progress through the junction; but remember, as described above, left turns can be made at any time, without waiting for a light signal. The overall cost in time to cyclists should therefore balance out. This kind of light phasing is probably most appropriate for Parliament Square, but there is another method that the Dutch use to keeping bicycles and vehicles separated at busy junctions – the simultaneous green for bicycles, or ‘tegelijk groen’. Here are some examples I shot on the Cycling Embassy field trip to Assen and Groningen, hosted by David Hembrow. The first is at a very busy junction in Groningen, approaching rush hour. Notice that motor vehicles are being held, in all directions, while cyclists are free to travel in whichever direction they please while they have their own green phase. It looks like chaos, but works perfectly – it’s very easy to make eye contact with people who might be crossing your path. Actually, it’s a lot of fun. Another example from Groningen – this time heading into the city at lunch time. Again, you can see the vehicles being held, while bicycles move in all directions. Ahead of me, you can see someone being given a ‘backie’ across the junction, sitting on the rack of someone’s bike – not really imaginable in London, as things stand. Now an example from Assen, in the rain. At the two examples shown above, I only had a short wait – this one is slightly longer. But remember, if I had been turning right, I wouldn’t have needed to use the junction at all – the path continues around behind me. Again, a little chaotic, but entertainingly so. As you can hear David Hembrow saying in the first video, these arrangements do involve adding a phase to the light signals, and so will reduce the junction capacity for motor vehicles. Of course, there are many less motor vehicles queuing here than might be the case, due to the large numbers of journeys being made on bikes. I didn’t see any signs of the typical congestion – the type that besets an equivalent-sized UK town – in Assen. Bicycles are more efficient that cars, so facilitating their use benefits everyone. These simultaneous green junctions are really only appropriate at smaller-scale junctions, rather than at larger ones like Parliament Square. 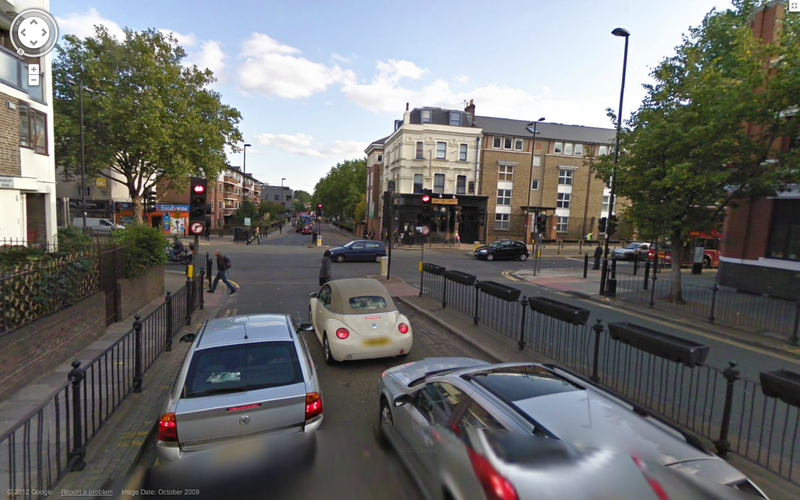 An analogous junction – similar to the Groningen and Assen examples – might be the intersection of Essex Road and Canonbury Road in Islington. He has crossed the ‘inbound’ cycle track safely, and then walked past the cars held at the red light, before passing behind the bicycles (us) emerging into the junction. 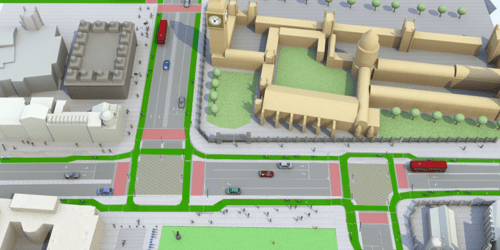 This may, of course, be more problematic with higher pedestrian movements, or with rather less civilised cycling behaviour, but those junctions with higher pedestrian movements are likely to be those similar to Parliament Square, where dedicated phases are more appropriate. Ministers… have pledged £11 million for Bikeability training to help a new generation of cyclists gain the skills and knowledge they need to cycle safely…. after a successful trial in London, councils across the country can now apply to use Trixi mirrors to make cyclists more visible to drivers at traffic lights. Mirrors, sensors and training all help, of course, and have their place, but they are sticking-plaster solutions which do not address the biggest source of the danger – the environment. Design changes cannot happen immediately, of course, or even in the near future, but we need a firm commitment to change the way our junctions themselves are designed, using continental best practice, to ensure that over the course of the natural cycle of repair and renewal, our junctions become both objectively and subjectively safer for vulnerable users, safe enough for the 56% of people who are put off cycling by the hostile appearance of our urban roads and junctions. Mirrors, sensors,ASLs and training are not enough to change their minds. 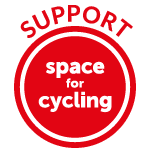 This entry was posted in Cycling Embassy Of Great Britain, Cycling policy, Infrastructure, LCC, London, Road safety, Simultaneous green, The Netherlands, The Times' Cities Safe for Cycling campaign. Bookmark the permalink. Great article, find it fascinating how far ahead Europe seem to be with this stuff compared to London. I think if cycling was safer more people would be willing to take it up. I certainly wouldn’t fancy my chances around London at the moment. Watching the clips of the cyclists navigating the junction on a green reminds me of some of the clips I’ve seen of roads in India which initially look chaotic as you have 3 “lanes” each way and all manor of vehicles from cars, lorries, put-puts (correct name for those 3 wheeled motorised trikes?) and bicycles all interacting without incident! I think it has something to do with people NOT being intentionally reckless – despite what the tabloids may want us to believe, I don’t honestly think anyone on a bike or car wants to injure themselves or damage their vehicle, so this natural form of give and take comes into play and people can negotiate paths successfully. As you say I really do think that the Conservatives are almost all completely missing the point wiht the Cyclesafe scheme, a lot of the problems with have with health, congested roads and public transport could be solved by giving people viable alternatives. I know it’s not going to happen overnight but I really do feel/hope we are on the verge of a big change with regards to cycling as long as we can avoid the “sticky plaster” solutions. It’s akin to handing out stab vests and offering self defence classes to those who live in areas with high levels of knife crime as opposed to actually going after those with the knives, we need to treat the causes of danger on our roads as opposed to trying to dealing with the potential consequences. Ahead of me, you can see someone being given a ‘backie’ across the junction, sitting on the rack of someone’s bike – not really imaginable in London, as things stand. I really like simultaneous green junctions. We’ve a lot of them around here and they work really well. Apart from the safety and convenience factors, there’s also something really satisfying about bikes being the vehicles on the roads when the light goes green. I thought I should point out that they sometimes are used on quite large junctions, such as this one. What value do you believe that the mirrors on trucks and the skirts on the bottom to reduce the number of people trapped under them have? If you are riding next to one of these dozen+ tonne vehicles that would be intimidating. When one passed with centimetres to spare on a dual carriageway, that was enough for you so you left the road. If you being relatively hardened and cycling in conditions that would make your mother send you a sympathy card are frightened, no telling how unwilling the average joe would be to cycle. When your daughters were 8 you were fine with letting them cycle every which way they wanted on Dutch cycle paths. But no parent would let their kid cycle next to a big lorry. Still it might be a bit helpful, reduce a little bit the collisions. Not improving subjective safety much, if at all, but might help objectively.